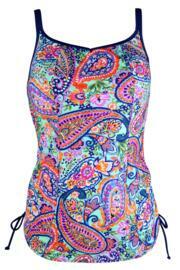 Want a tankini you can fully relax with on the beach this summer? 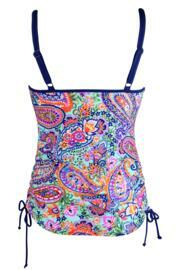 The Bohemia underwired tankini from Pour Moi has you covered with a range of unique features that you just won’t find on the high street. Want to get some sun? Ruche it up at the side, creating pretty gathers that never look untidy. Time to head to grab a drink at the beach bar? Pull down the ties so they sit on your hips for a pretty blouson effect that skims down your body. In a popping paisley print that nails the boho look, there’s built-in hidden underwire support to boost your shape, no matter how you wear it. Full coverage has never looked so flattering! Lovely design. Accurate cup sizing.